Indian food is well known for vegan and vegetarian fodder and this carrot and chickpea curry is super simple and packed with big flavours! This carrot and chickpea curry is a proper corker of a dish. It was born of the result of a glut of carrots a few years ago. Seriously we grew tonnes of them, so many that we even tried to make carrot wine. Don’t do it! Seriously! 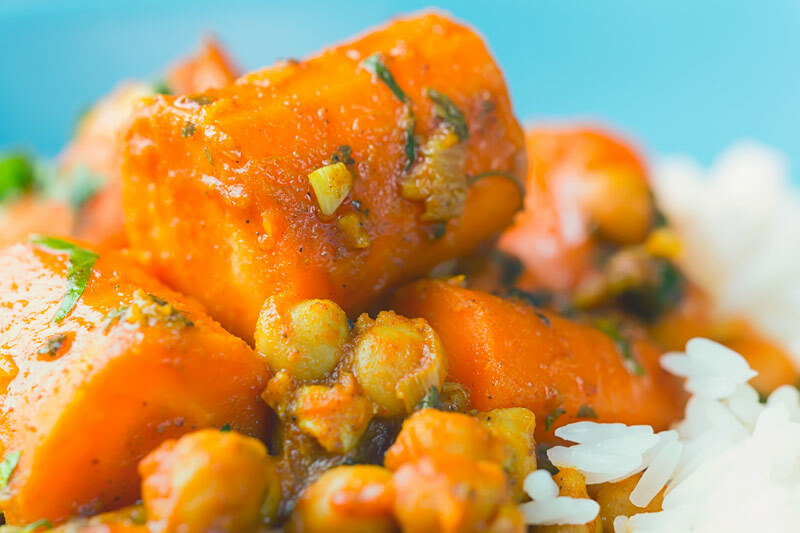 This carrot curry, on the other hand, comes highly recommended. It features some big Indian flavours and a really thick and unctuous curry sauce. 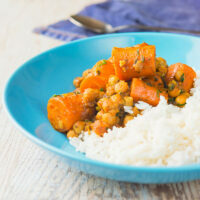 I already have a pretty traditional Indian chickpea curry here on my site. That chole is marvelous, however, my latest recipe is a bit of a conglomeration of influences but no less wonderful. 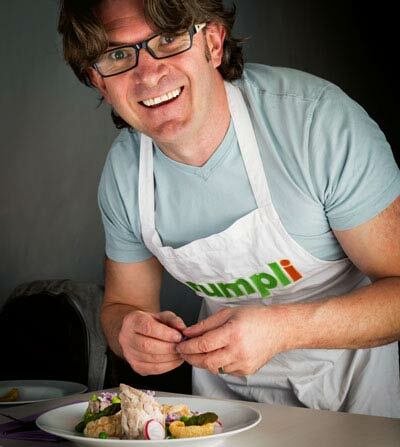 I have not hidden my dislike of vegan or vegetarian substitutes in meals here on my site. I am neither vegan or vegetarian but I am a lover of good food. India is well known for a very rich and vibrant meat-free culture and you should all know by now I am fond of Indian flavours. This curry recipe is vegan because it is, not because I feel it should be. These ingredients, just like those in my aloo gobi and saag aloo recipes are better without animal produce. 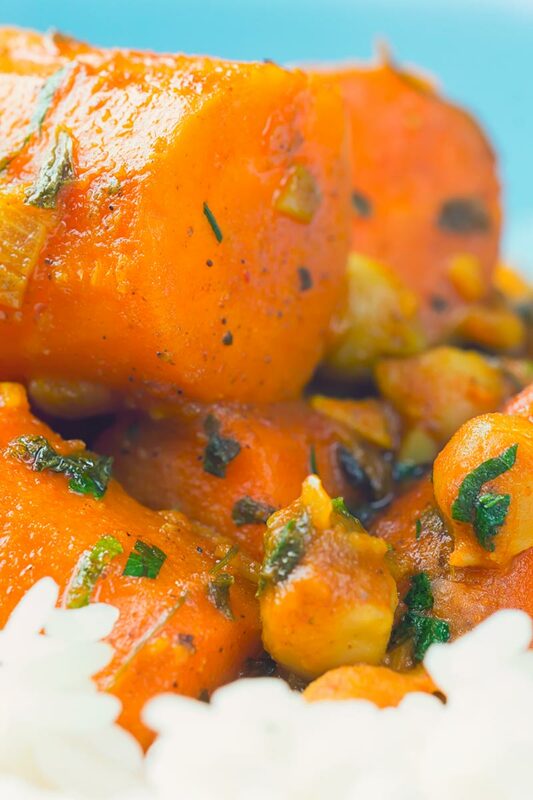 The sweet carrots are a fantastic foil against the spicy summer sauce and the chickpeas carry huge amounts of flavour. How To Cool Down A Spicy Curry. To my mind, this chickpea curry is a spicy one. This does, of course, depend on the type of Kashmiri Chili Powder you use. It does vary massively in heat depending on brand, so you will need to experiment a little at your end. Naturally, the simplest way to reduce the heat of a curry is to reduce the amount of chili. Although that has the consequence of reducing the chili flavour as well as the heat. My favourite way to cool a curry is with either yoghurt or coconut milk. Both have a wonderful way of tempering that immediate burn. Of course, a naan bread also helps cool your mouth, so long as you do not dip it in the sauce of course. This recipe gets cooked all of the time and I invariably used canned chickpeas. They are absolutely fine and work really well. You can cook your own chickpeas and use them but they need soaking overnight. Although if you have a pressure cooker you can speed up that process. This is not a planned meal for me though, it is one of those “chuck it together” meals that can happen quickly and without fuss. It reheats fantastically and it even freezes relatively well, although I would not leave it too long. Peel and cut the carrots into 3cm lengths. Grate the ginger and mash the garlic. Heat a pan over a medium high heat and when hot add the cooking oil. Fry the carrots in this oil for 10 minutes, you want them to get a little bit of colour. Whilst the carrots are frying combine all of the spices with the exception of the fenugreek in a bowl. When the carrots are nicely caramelised add the onions and reduce the heat to medium and fry for 5 minutes until translucent. Then add the garlic and ginger and cook for 60 seconds. Increase the heat to medium hight and then sprinkle over the spices and allow to toast for 60 seconds, stirring to ensure they do not burn. Add in the tomatoes, coconut milk, and chickpeas and then stir to combine. Finally, add the fenugreek, season to taste with salt, and add a tight fitting lid and cook for 40 minutes on low. I like to serve this simple curry with simply cooked basmati rice. I made this dish this evening and it was really delicious. My husband who’s a real meat eater and not a fan of chick peas is really raving about it. The carrots made it really lovely and sweet. 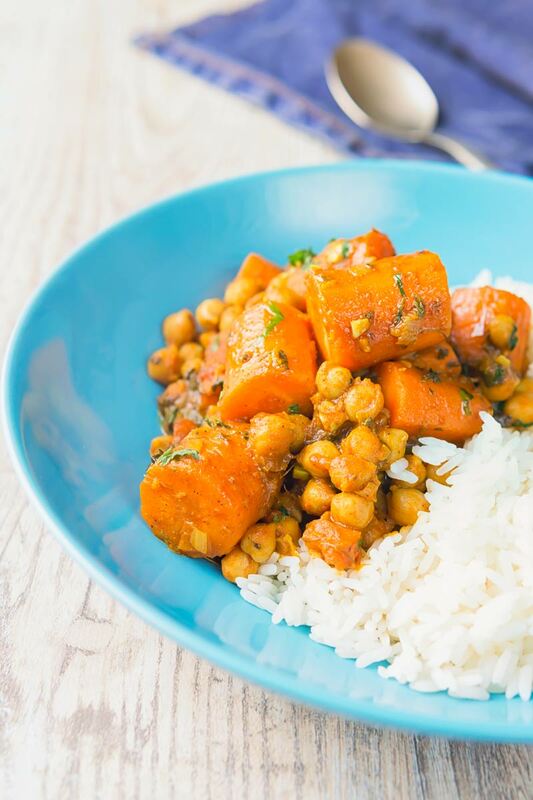 Glad you like it Jane and most importantly glad your husband liked it… Chickpeas can often be a challenge to cook with but treat em well and they work really well, I love a bit of sweetness in curries too so carrots are a fab addition! Love the flavors in this meal! It’s such a warm, comforting dish and so perfect for the winter season! This curry looks so delicious! I have been looking for some new vegan recipes to try so I will definitely be giving this a go! Enjoy, this one takes a while to cook but it super simple! This sounds so warming and healthy! Perfect for adding extra veg into your diet. I am not vegetarian or vegan by any means, but I find that Indian food with no products actually tastes better to me. 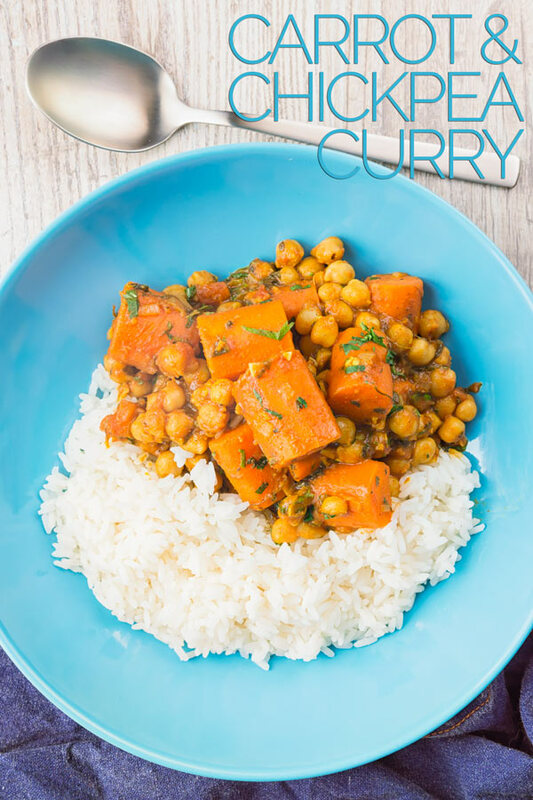 Anyways, this is an awesome looking curry, I always love chickpeas in my curry. Hi Brian, thank you for the incredible recipe! This dish was delish! When I made this dish, to me it was very sweet. I’m making it again tonight! Can’t resist!